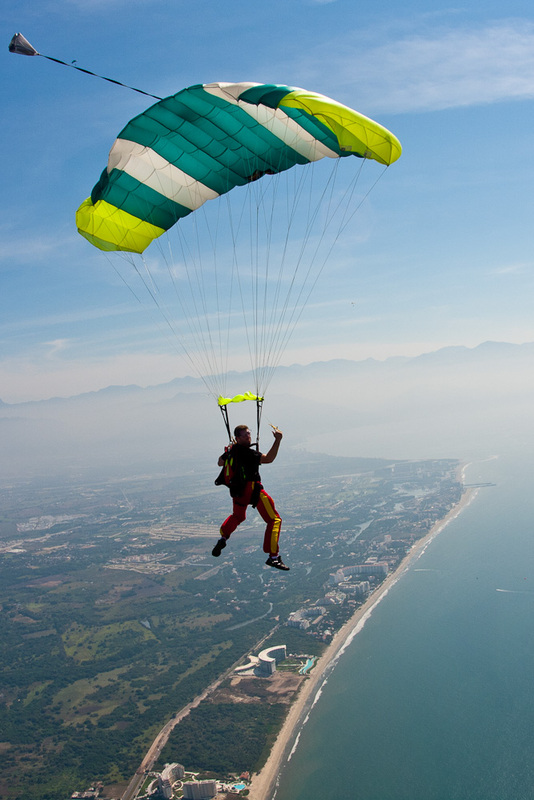 In Riviera Nayarit luxury means adventure, and it’s precisely a feeling of adventure what has caught the attention of skydivers around the world. On February 14 to 24, they’ll participate in the Riviera Nayarit Beach Boogie 2013, with a great number of events happening every day. “We’re welcoming some of the best skydivers in the world to enjoy the new jump area that has recently opened to the public. We want to start planning with them in order to break the World Record in 2014, said Diego Orozco, from Skydivemex, who’s organizing the event. According to Orozoco, this year will be a true celebration, because more than 100 skydivers will jump from over 13,000 feet, with a freefall lasting over 1 minute, and reaching a speed of 125 mph before they open their parachutes and begin their planned descent to the beaches in front of the Hard Rock Hotel Vallarta. “There will be skydivers jumping continually for 10 days, and the skies of Riviera Nayarit will dress up in color, providing a great show and also opening up possibilities for those who have never experienced skydiving, as they’ll be able to do it in tandem with some of the best professionals in the world. The goal of this event is to promote and develop the sport.” stated the head of Skydivemex. The Convention and Visitors Bureau (CVB) of Riviera Nayarit supports events like the Beach Boogie 2013 as a joint effort with the Government for the People, headed by Roberto Sandoval Castañeda, which is posed to become an attraction for tourists and will attract visitors to Mexico’s Pacific Treasure, improving the economy for all the people in Nayarit. great! were can we booked or wach the show?